Before mounting an expedition, paleontologists first look to geologic maps of a region to determine if the right time period is actually present. Then, ideally, they look at aerial photographs or they make a visit by airplane, automobile, or foot to determine if those rocks are exposed and accessible and free of thick vegetation or water cover. Often paleontologists and geologists will explore regions of interest together. If they are interested in fossil hominins they look at rocks dating to the Miocene, Pliocene, and Pleistocene. But if they spot enormous bones spilling out of Cretaceous rock layers, they will alert their colleagues who study dinosaurs. Once fossils and artifacts are discovered, more precise dates need to be estimated for them in order to put them into the context of human evolution. Either the fossils and artifacts themselves are dated (direct dating) or the rocks and sediment that contain the fossils are dated (indirect dating). It is often best to date the rocks rather than the fossils or artifacts to avoid damaging the specimens. Because of error ranges associated with dating methods, a combination of methods is used. By combining relative methods (approximate ages) with absolute methods (exact ages with error ranges) it is possible to put a specimen into a more precise context. 1. The Law of Superposition—Deposits deeper in the ground are older than those that are closer to the surface. 2. The Law of Original Horizontality—Strata are deposited (e.g., by air, water, volcanic eruption) horizontally and if they do not appear horizontal, then geologic processes like faulting or doming have altered them. 3. The Law of Original Continuity—Equivalent deposits that are separated by a canyon, for example, were the result of the same depositional event and once belonged to the same continuous layer before erosion separated them. During long stretches of the Earth's history, the magnetic field was opposite to what it is now. The present state is called "normal" and the opposite is known as "reversed." Iron crystals in heated rocks will act like magnets and orient themselves in the direction of the poles when the rock cools. So the nature of the Earth's magnetic field at the time the rock formed is recorded in its polarity. Rocks that are dated absolutely and that also reveal their polarity allow geologists to construct a sequence of paleomagnetic changes through time and these are verified by the record known from deep sea cores. Then if a fossil is found in a rock that does not allow absolute dating, the geologist can apply relative-dating logic to the paleomagnetic readout (based on whether the rock is "normal" or "reversed") to place the fossil in a particular time frame in history. Paleoanthropologists find many more fossils of nonhominins than hominins and these allow them to reconstruct the environment that hominins were living in. Nonhominin fossils are also helpful for relative dating with a technique called biostratigraphy. The age of a hominin fossil can be determined by the fossils of other well-known (and well-dated) animals that are associated with it. For example, if a certain well-known species of fossil pig is found in the same layer as a hominin fossil at site A, and this pig species is also found at site B that is dated to 6 Mya, then it is probable that that site A is also 6 Mya and therefore the hominin fossils are that age too. How was the pig at site B dated in the first place? Absolute dating is a way to estimate dates for fossils and artifacts, usually within a range of years. Methods of radiometric dating are a large component of the absolute dating approach. Radiometric dating methods are based on the known constant rate of decay of isotopes (radioactive forms of elements) through the loss of particles in the nucleus of atoms. Radiocarbon dating, or carbon dating, is the best known of these methods. Since all living organisms contain carbon, artifacts like wood and bones can be directly dated with this method. Plants and animals take in C14, an isotope of carbon throughout their lives. When they die, the C14 begins to decay into nitrogen (N14). Death starts the radiometric clock ticking. The decay of C14 happens at a constant known rate and when the C14 present in an old bone is measured, an age can be given to it based on how much has decayed. The time it takes for half of the radioactive isotope in a sample to break down is the half-life. Half-lives are different for every radioactive isotope. The half-life for C14 is 5,730 years, so that in that time, half of the sample of C14 has decayed. With such a short half-life, specimens over 50,000 years cannot be dated according to C14 decay because in that time all the C14 will be decayed and gone from a specimen, making it impossible to measure and date. Hominin fossils from Europe and Australia have been dated with this method, but the applicable scope of carbon dating excludes most of the fossil record for human evolution. The half-life of potassium (K40) is 1.3 billion years. It decays much slower than C14 so dating methods using potassium are applicable to the rest of the hominin fossil record over 100 Kya. Garniss Curtis and Jack Evernden developed a method which tracks the decay of K40 into argon (Ar40) in rocks, a method that is similar to carbon-dating except instead of dating the object of interest it dates the rocks around the object. During the extreme heating that occurs during volcanic eruptions, argon is eliminated from the rocks in the volcano. When the lava cools, it contains the radioactive isotope K40, but no Ar40. The cooling and solidification of the volcanic rock sets the clock at zero and starts it (just like when the organism dies for carbon dating). K40 decays into stable Ar40 within the solidified lava rock over time. If that rock happens to contain a hominin fossil or if it is located just above or just below a hominin fossil or stone tool, a sample of it will be collected and then taken to the laboratory to be heated. Scientists will measure the relative amounts of K40 and Ar40 to determine how much decay has occurred and based on that, they can estimate how old the rock is and therefore how old the fossil associated with it is. A somewhat more precise variation of the K/Ar method is based on the same idea and measures the amount of decay of Ar40 into Ar39, in a method called 40Ar/39Ar. Obviously K/Ar dating does not work for hominin sites without volcanoes nearby to spew ash and lava. Luckily many of the hominin fossil sites in East Africa are located in proximity to the Great Rift Valley, which is a volcanically and geologically active fault zone where Africa is literally splitting apart. The Rift's many volcanoes were highly active during the course of hominin evolution, laying down layers of ash called "tuffs" that enable geologists to build a dating sequence (Figure 3.3). For example, fossils preserved between ash A dated to 1.6 Mya and ash B dated to 1.5 Mya are estimated to be between 1.6 and 1.5 Mya, or averaged to 1.55 Mya. Not only are tuffs convenient for absolute dating, but because each tuff from a volcanic eruption has its own unique chemical fingerprint, tuffs can be traced over great distances to allow sites to be correlated and compared. 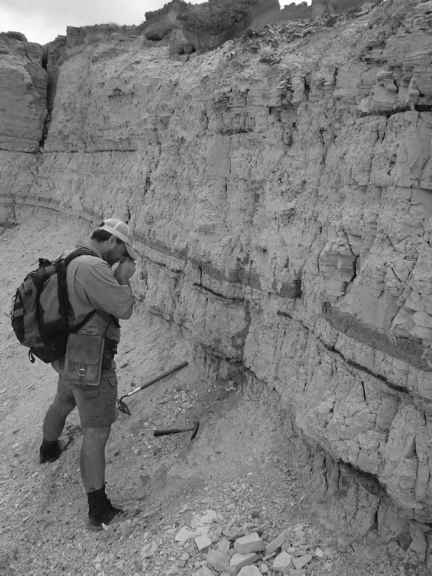 Figure 3.3 A geologist searches a site in the Middle Ledi region of Ethiopia (near the Hadar region) for the right type of volcanic ash to use for 40Ar/ 39Ar dating. The dark bands of volcanic ash are approximately 3 million years old and are preserved within layers of white lake deposits. Photograph courtesy of Guillaume Dupont-Nivet and Chris Campisano. off ("luminescence"). TL is the preferred method for dating hearths at home bases and camp sites since it is possible to decipher if and when a rock was heated (that is, "reheated" since it was first heated during its formation). Different dating methods are appropriate for different materials of differing ages. Whenever possible, scientists use multiple methods. Unlike radiocarbon dating, however, which can sometimes date an artifact to within 100 years, methods for hominin fossils rarely get any closer than estimated ranges within a few thousand years. With increasing technology, the resolution of dating techniques is getting much more precise, with error ranges becoming smaller and smaller. The ability to precisely pinpoint a fossil's place in time in the story of hominin evolution (within a few thousand years as opposed to a few tens of thousands of years) is becoming the expectation.